Last weekend I went back to the zoo to buy the pass that would allow me inexpensive access the place for a whole year. Of course I took advantage of being there to do some quick drawings. Being late in the afternoon, on an overcast day, seemed to suit the animals as I got to see quite a few that were tucked out of sight on our previous visit. 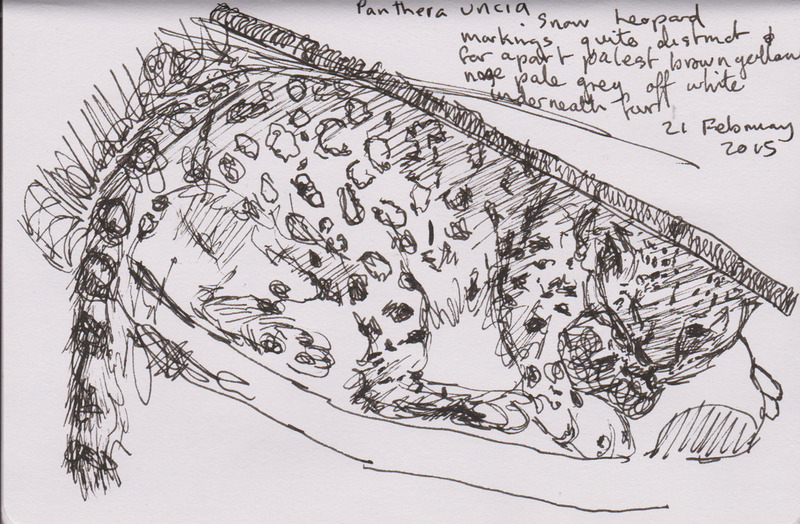 The first of these was one of the two Snow Leopards (Panthera uncia) that the zoo has. While I was looking at the leopard it was often looking right back at me, always an interesting experience. 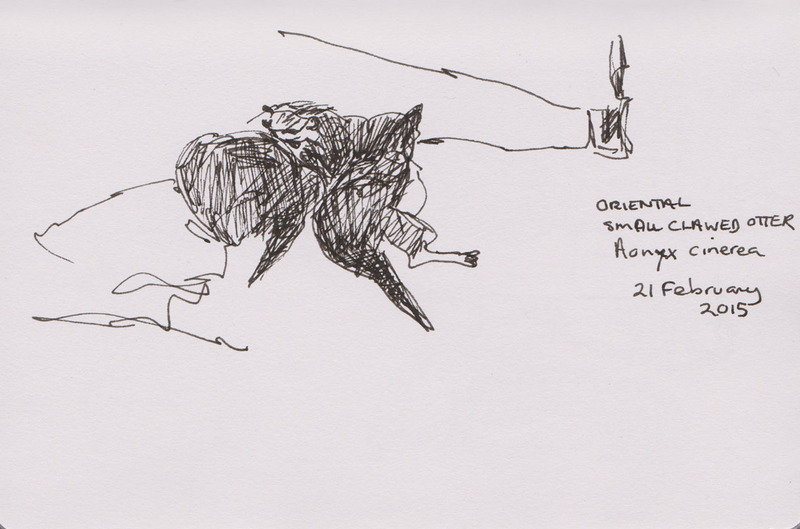 The Oriental Small-clawed otters (Aonyx cinerea) were alternately curled up in a tangle together or racing around their enclosure waiting for their dinner to be served. Their tails are broad at the base and taper to a point. 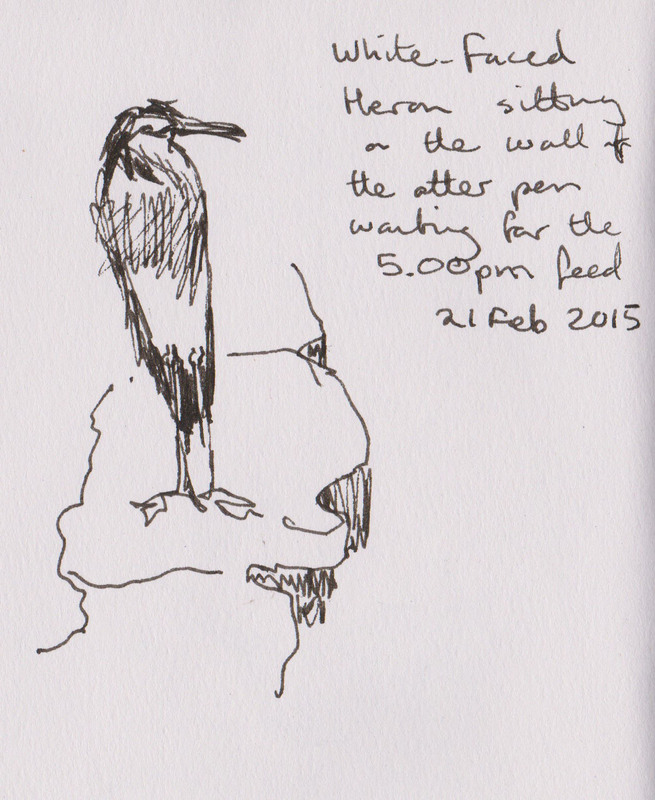 Sitting on the wall of the otter enclosure was a White-faced Heron (Ardea novaehollandiae), who had worked out that otters are messy eaters and easy pickings were to be had if it hung around long enough. 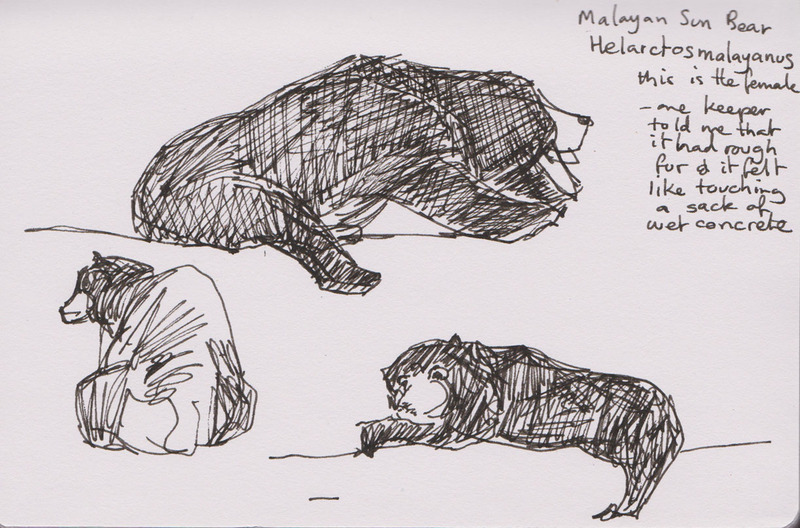 Not far away was the Malayan Sun Bear (Helarctos malayanus) enclosure. A passing keeper told me that I was looking at the female bear and added that the bear had rough fur and patting the bear felt like touching a sack of wet concrete. The bear’s fur looked very dense and its body was clearly very ‘solid’ underneath it. It’s not surprising that the habitat of the bear is tropical rainforest and montane forests where the dense fur is able to repel rain. I watched while the bear moved around on the telephone pole log frame in her pen, the logs she was on are about 3-4 metres above the ground. There’s been a lot of activity in our area with workman replacing old terracotta sewage pipes with new high density plastic ones. As a result all sorts of trucks and trailers have been around. This truck and trailer conveniently pulled up on my neighbours nature strip, (the bit out the front of the house where the footpath might go, but hers is just grass). I used a whole stack of different media on this drawing. The pen and ink was a bit dark so I used white gouache to pick out some of the elements of the truck. I also added some acrylic marker for the colour elements. I’m continuing to use my bits of newsprint stuck to thin Japanese paper as a substrate. I’m not sure what problems this might cause for long term survival of the drawing, but since I’m ‘mucking around’ I’m not too concerned. I really like it as a background. I’ll give you the hot tip, the best pages to use turn out to be stock market reports, TV pages and the racing form-guide as these are about the only pages in the newspaper these days that don’t have photographs on them. It was an unusual combination of activities that we went to this Sunday afternoon. 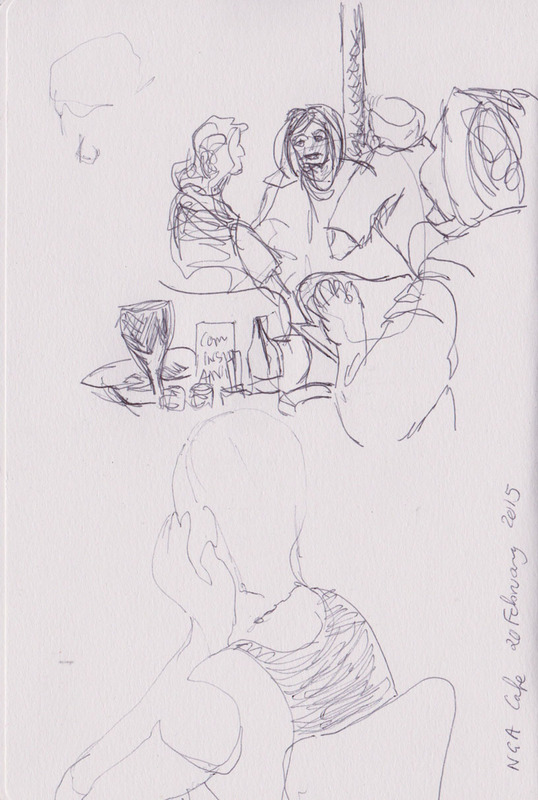 Firstly there was ‘Drawn In’, the monthly drawing activity held at the National Portrait Gallery. 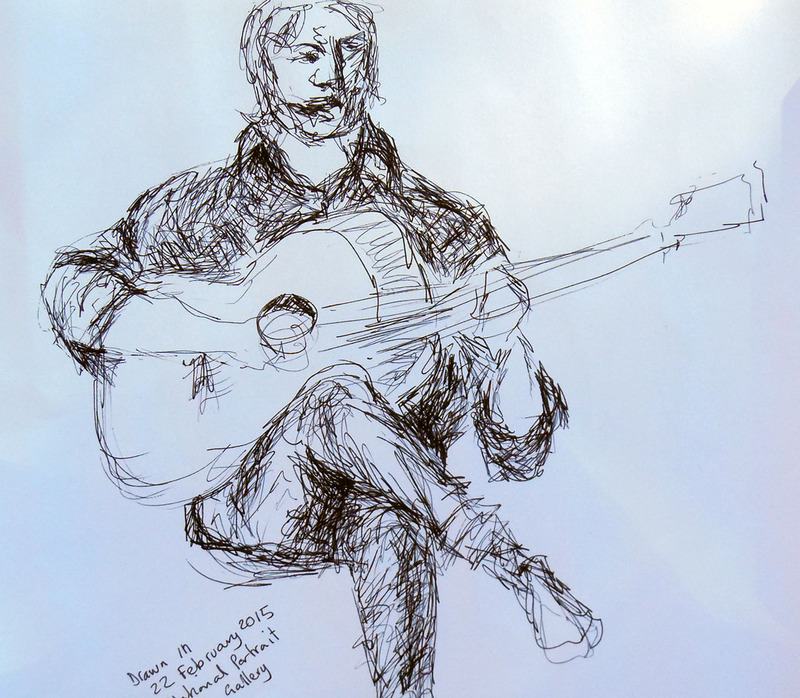 Today Leila and Michael from The Night Cafe performed a range of latin, gypsy and jazz music on guitar, flute and voice. It’s great to be able to draw people in action. Michael’s guitar playing provided an interesting pose. 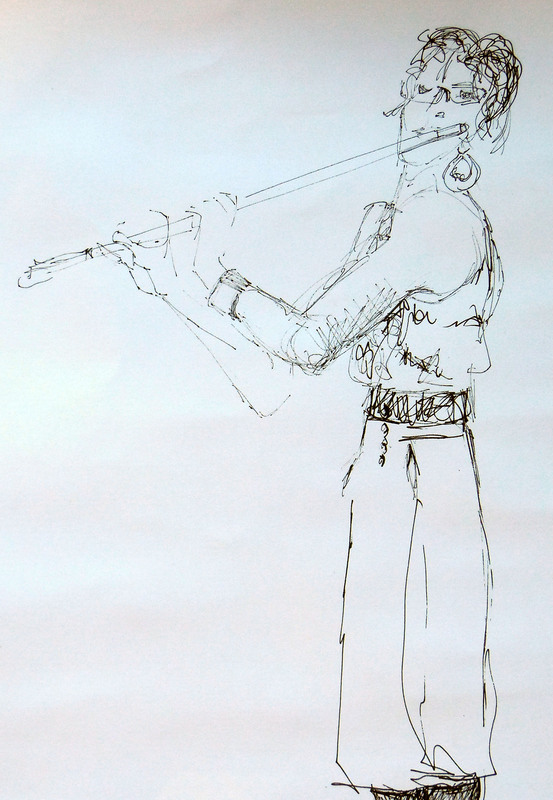 Leila proved to be more of a challenge to draw as she moved between her flute and vocals. I found her hand positions on the flute fun to try and capture. 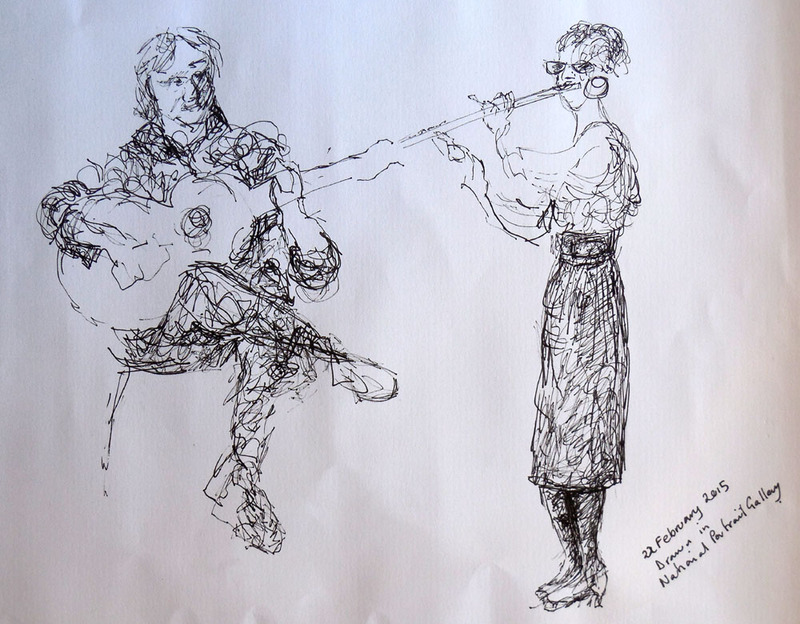 Thanks to both musicians for allowing themselves to be scrutinised by so many interested pairs of eyes. 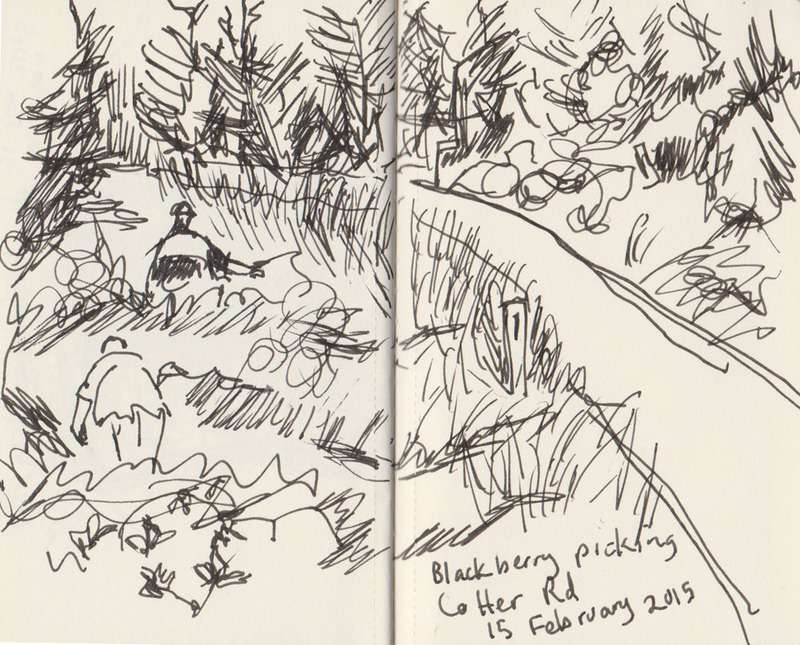 If an afternoon of drawing wasn’t enough we had a second outing to attend. Over on the slopes of Black Mountain we joined the Friends of Black Mountain and Ajay Narendra to look at the local ant fauna. There are over 120 species of ants on the mountain so before long we were examining ants, subterranean and arboreal, biting and non-biting. Ajay shared all sorts of interesting information about ant behaviour and identification. I was most impressed by his ability to gently hold an ant by its legs, between his fingers, before releasing her gently back to where she was picked up (most ants you see are sterile females). Of course it was slow progress as there were so many different types of ants just in the short part of the path we walked along, so I had time for a sketch in between ant species. Drawing people continues to be the steepest learning curve for me. I like Hallie Batemen‘s comment that people on mobile phones are good subjects to draw as they are generally oblivious to you when they are talking on the phone. 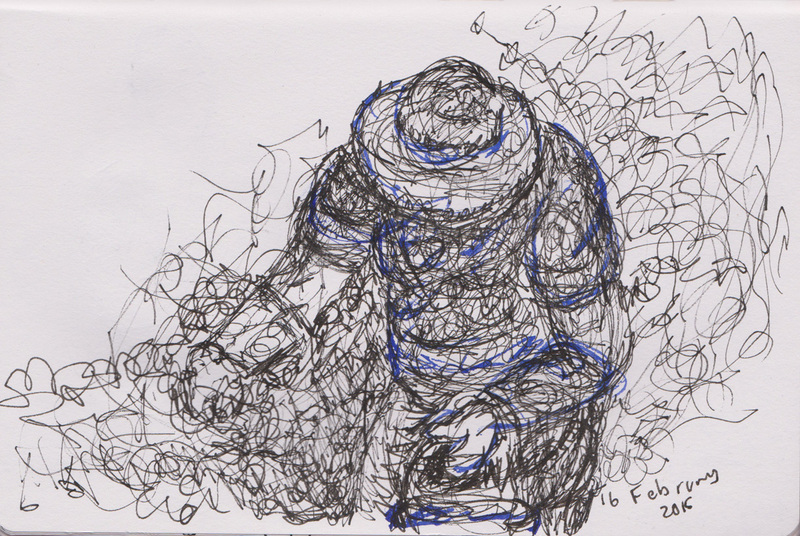 Last week I discovered another good category of people to sketch – smokers! I know this sounds odd but since the introduction of smoke free environment laws in the ACT smokers are exiled to congregate in small clusters, outside, away from offices and shops. I discovered such a sad cluster across the road from where I was having a cup of coffee early this week. It was too good an opportunity to pass up. And it doesn’t stop at smokers either. 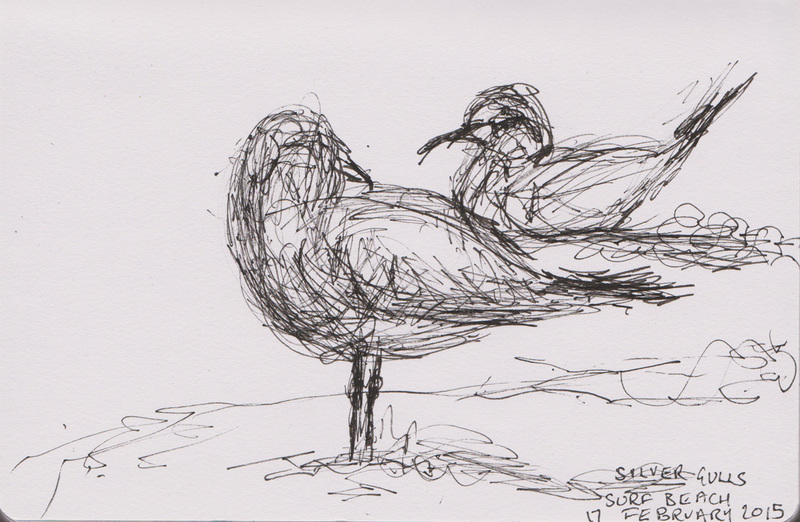 I know its not exactly life drawing, but I’m also happy to take advantage when passing by suitable figurative sculptures. 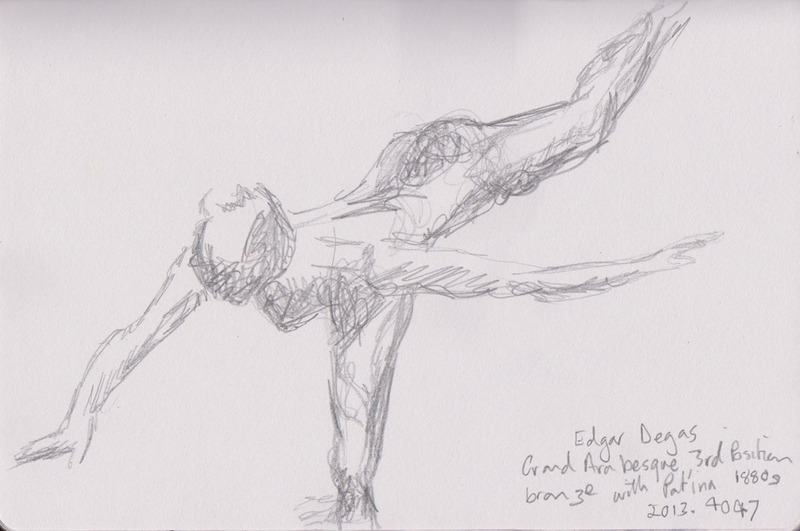 I spotted this small sculpture by Degas in the National Gallery of Australia (NGA) a few days ago and made a drawing of her as well. 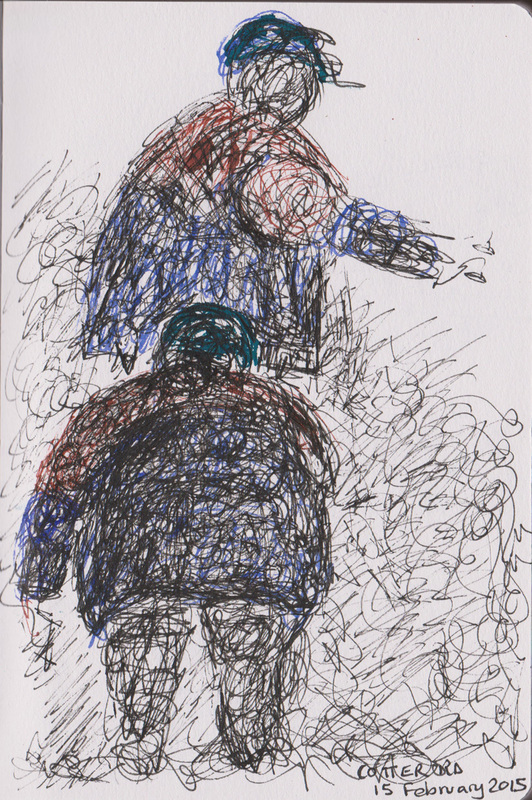 I must say that Degas gave her arms a more albatross-like extension than they would have had in real life, (I want you to know it isn’t my wonky drawing). 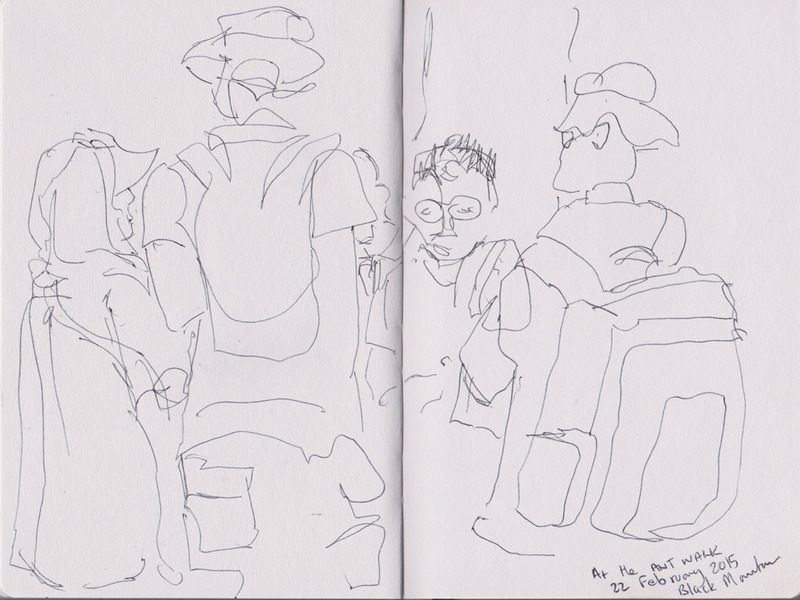 I also managed to capture a page of cafe-goers in the NGA cafe on the same day. If our last beach outing was overcast and damp then yesterday’s visit was the complete opposite. Clear sunny skies with a stiff breeze and plenty more people on the beach. 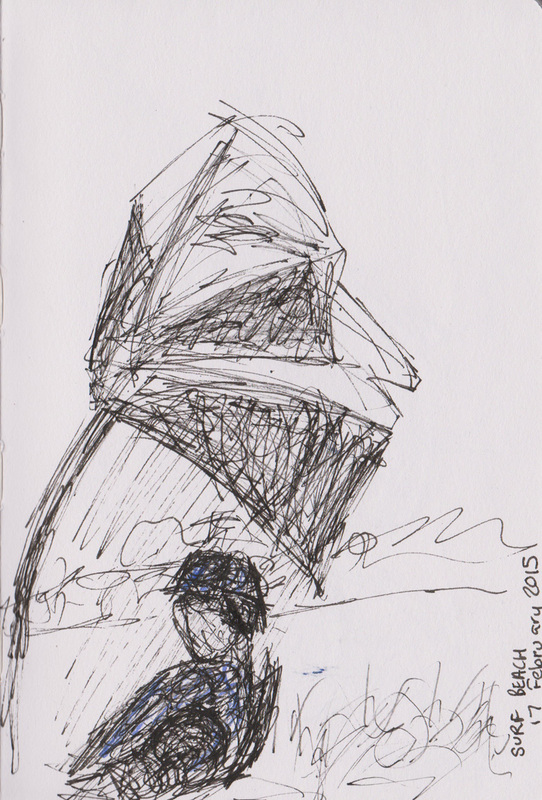 We put the Sand Palace up and sitting in its shade, used our lunch break to do some sketching (myself, my partner and another friend) – that is of course after we scoffed our fish and chips. My partner spotted this entertaining sight further up the beach. This man was getting shade from an umbrella that he clearly had given up trying to keep the the right way out. and some seagulls (Silver Gulls if I’m being correct). 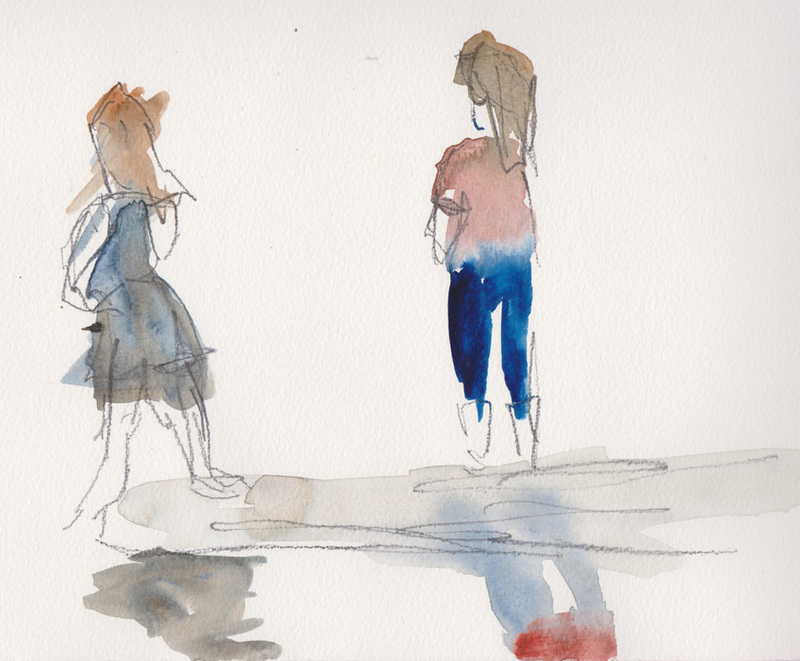 Last but not least I just squeeked out two quick watercolour sketches of people standing on the water’s edge, just before we headed back into the water for another swim. A favourite pastime in February is picking blackberries that grow rampantly around the ACT (Australian Capital Territory). This was a very quick sketch that I did while taking a break. 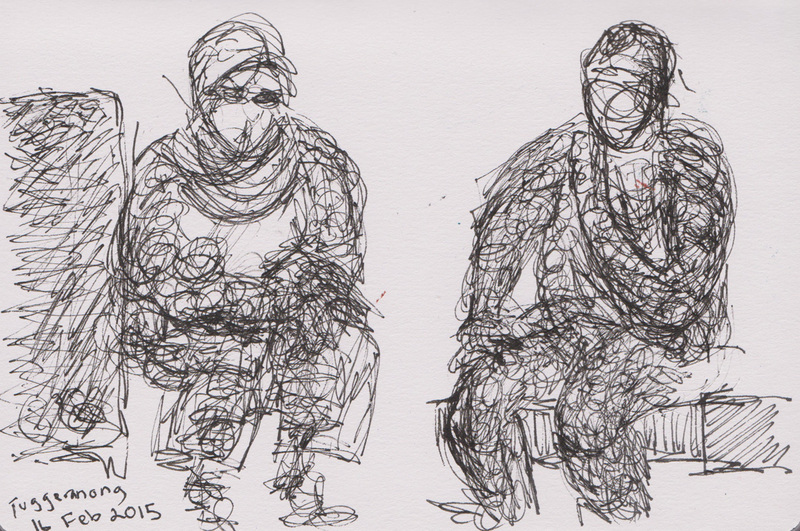 I subsequently decided to re-draw the figures of my friends, as I liked the shapes their bodies made. I’m hoping they’ll forgive me their bulky outlines. 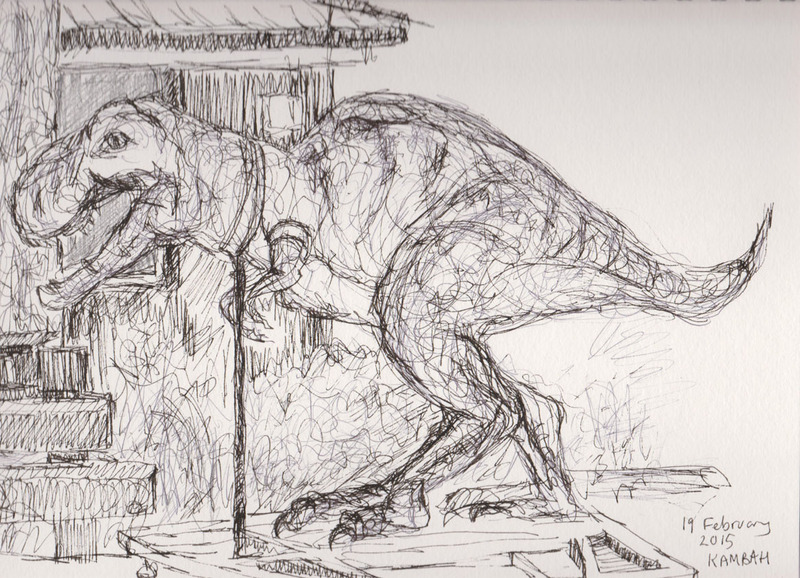 I was drawing using two pens at the same time which inevitably seems to expand the girth of any subject. (In my defence they were also wearing overshirts to protect themselves from the thorns). Earlier today my friend sent me another photo taken a week beforehand, also picking blackberries. So I thought another re-drawing was warranted. I’m really enjoying the drawing with two pens/pencils at a time approach. I think what is appealing to me is how the technique generates volume, as opposed to outline. 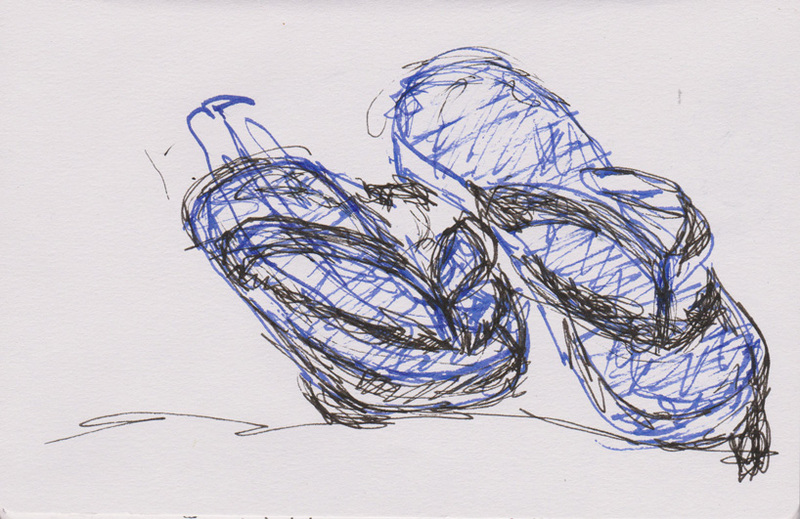 I’m reminded of Henry Moore’s drawings, even though I haven’t seen any that indicate that he used such an approach (if you have seen this technique in his work I would be interested to know). I found this introduction to an exhibition of Moore’s drawings held in 2010 in Zurich (ah the joys of the internet) which I thought made some interesting points. 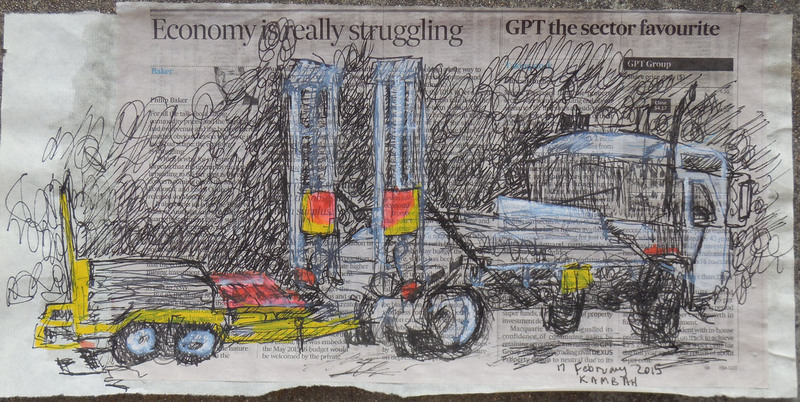 Putting to one side that this post contains several re-drawn images and one based on a photograph I liked Moore’s comment that “Drawing from life keeps one visually fit – perhaps acts like water to a plant – and it lessens the danger of repeating oneself and getting into a formula”. Nine men are at imminent risk of execution after their clemency applications were rejected by President Joko Widodo. They are Australians Myuran Sukumaran and Andrew Chan, Syofial alias Iyen bin Azwar (Indonesian), Harun bin Ajis (Indonesian), Sargawi alias Ali bin Sanusi (Indonesian), , Martin Anderson alias Belo (Ghanaian), Zainal Abidin (Indonesian), Raheem Agbaje Salami ‎(Nigerian) and Rodrigo Gularte (Brazilian). Indonesia has already demonstrated its deadly intent by executing five foreign nationals and one Indonesian just after midnight on 18 January. International condemnation followed and the Brazilian and Dutch Ambassadors to Indonesia were recalled. Death sentences in Indonesia are carried out by a firing squad of 12 gunmen. Prisoners are given a choice of whether to stand or sit and whether to have their eyes covered, by a blindfold or hood. Three rifles are loaded with live ammunition, while the other nine are loaded with blanks. Prisoners are then fired on from 5-10 metres. The death penalty is a violent and inhumane punishment that has no place in today’s criminal justice system. Evidence from around the world has shown that the death penalty does not work to deter crimes. State sanctioned killing only serves to endorse the use of force and to continue the cycle of violence. 140 countries have now abolished the death penalty. Indonesia has the opportunity to become the 141st country. Please, urge the Indonesian authorities to halt plans to execute the death row prisoners and to establish a moratorium on all executions with a view to ending the death penalty for good. If you would like to do more please write to the Indonesian President. You can do this through Amnesty International Australia.